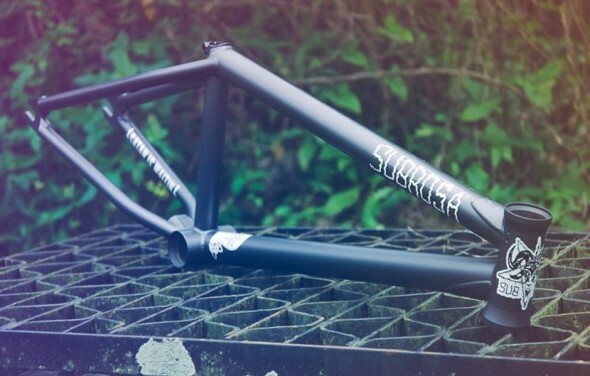 Subrosa Thunderbeast frames are in stock now and ready to ship! The Subrosa Thunderbeast frame is one of the strongest bmx frames ever made! Scott Ditchburn’s signature model frame available in 20.5″tt, 20.75″tt, and 21″tt sizes in matte black or concrete grey (shown). Click HERE to view all available options we have in stock and ready to ship. Features include heat treated 4130 chromoly tubing, double butted top tube, double butted down tube. Headtube, BB and dropouts all Deathproof heat treated for the ultimate strength. Ovalized down tube and thicker chain stays prevent denting associated with grinding. Investment cast wishbone and seat stay bridge. Chain stay and seat stay flattened at drops to accept hub guards. Laser cut 6mm dropouts to match 34mm pegs such as Shadow or Subrosa pegs as well as many others. Top and down tube gussets with Subrosa debossed logos. Low profile removable brake mounts. Integrated seat clamp. Chain Stay: 13.75” with room to remove wheel, 13.5” fully slammed. Includes deluxe Thunderbeast decal sheet. « Subrosa Warhead, Warhead XL, and Combat locks are in stock now and ready to protect your bike!